I know this isn’t the kind of thing I usually talk about on here but for those of you who are interested, this is a great video produced by EJF – one of the speakers taking part in today’s conference. If you are in London and are interested in this conference, it is today at 6:30. Click here for more info. Creative fashion is not only about DIYing but also about having fun with your style wherever your clothes were purchased. Fashion is about expressing yourself through what you wear and playing with clothes and accessories to fit your mood, an event or even your general personality. When looking for inspiration, the high-street can become a little hypnotizing and you may find it difficult thinking about the clothes you have at home to mix and match with your potential purchase or even find you end up buying things you wouldn’t normally dream of wearing. Of course shops have a million ways of making this happen, starting with the brain washing lights and music and the abundance of clothes in the depth of their shop. So, sometimes it’s nice to shop in new places, places that will inspire you to create yourself rather than beg someone helplessly to take your money and tell you what to wear ; ) A great place to go for a bit of something different is your local charity shop. The charity could be for cancer, it could be for the homeless it could be for the RSPCA like mine is. Whatever the cause it’s definitely a good one : retail therapy for next to nothing ! Take a look at what I found in my local RSPCA shop this month, for a total of UNDER £20 ! Necklace : I like this as it is so I will probably wear it a couple of times before it sees some serious DIYing – I have plans for you my precious ! 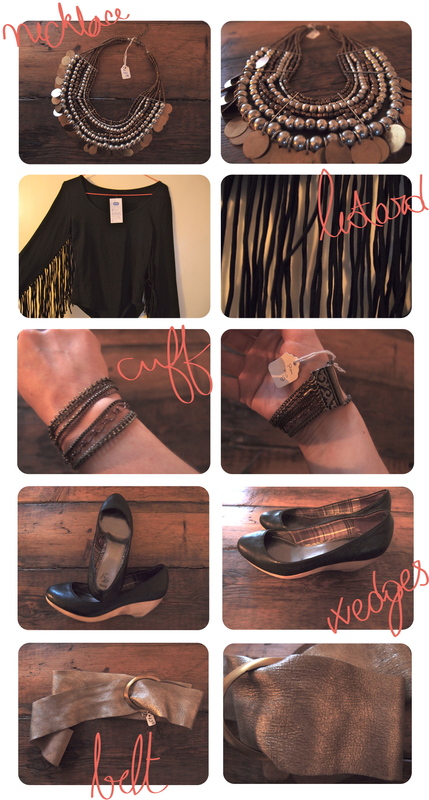 Leotard : I once fell head over heels for a Manoush poncho with fringes all over but unfortunately couldn’t afford it. It will always be in my ♥… But now this leotard will be on my back ! Cuff : Spot on this season with multiple chains ! Love it ! Belt : A metallic soft leather belt from Topshop – bargain baby ! Have you recently had any successful charity shopping sprees ?